What is diabetic retinopathy and what do I do about it? Diabetes is a disease which is growing in number as the years progress. According to statistics produced by the American Diabetes Association, approximately 7% of the U.S. population is living with diabetes. In addition to the various types of diabetes, there are also other diseases which are caused by the presence of diabetes. One such condition is diabetic retinopathy. The following will describe diabetic retinopathy including what this condition consists of and ways to treat it so that the person suffering from such a condition can live a healthy and productive life. Diabetic retinopathy is essentially various changes which occur to the blood vessels of the retina. Those with diabetes have a chance of being susceptible to diabetic retinopathy and therefore should know about this condition, what it consists of and how it is treated. There are two types of diabetic retinopathy which include background diabetic retinopathy and proliferative diabetic retinopathy. The former type of diabetic retinopathy is the more common of the two and consists of hemorrhaging within the retinal layers and frequently the formation of protein deposits on the retina. It is these occurrences which cause vision to become less in the macula portion of the eye. The proliferative type of diabetic retinopathy occurs when, in response to the hemorrhaging and formation of protein deposits, a lack of oxygen results. When this decrease in oxygen takes place, new vessels will form in response thereto. Since these new vessels are of a fragile nature, they are often likely to bleed and may cause vitreous hemorrhaging. It is this final occurrence which can lead to the proliferative diabetic retinopathy and result in severe vision loss. This type of retinopathy is much more serious than the background type but fortunately it is also much less common as well. The main sign of diabetic retinopathy is a sudden and unexpected change in your vision. Individuals who wear glasses may find that their prescription which once was perfectly suited for them is no longer. With that said, a change in one’s vision does not automatically mean that diabetic retinopathy is present as there are many other causes for vision change. 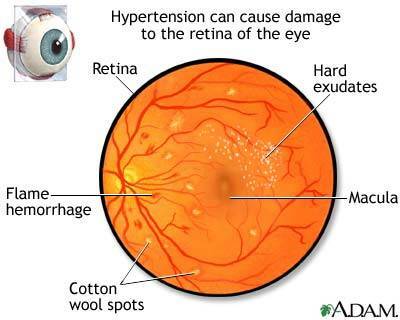 However, it is one of the warning signs often accompanied with diabetic retinopathy. In order to diagnose a diabetic retinopathy properly, a dilated retinal examination must be performed by a medical professional in addition to a thorough examination of the individual. If the doctor diagnoses the patient with diabetic retinopathy, a laser type treatment may be recommended. The procedure consists of having the laser directed towards the retina. The patient will have anesthesia drops in the eye, a contact lens placed over it and the laser treatment performed on the eye. In addition, the main way to treat diabetic retinopathy is to keep one’s diabetes in check. Some of the ways to maintain one’s health and keep the blood sugar level at a normal rate is to eat healthy, exercise and keep one’s weight within a certain range. Many who experience diabetic retinopathy may wonder if the laser treatment will cure them with regard to having their eyesight regained completely. Although the laser treatment may aid in preventing further damage to the eye, it will not put the vision back to normal. With that said, laser treatment has been a very successful way of protecting the individual experiencing diabetic retinopathy from future vision loss and preserving the vision which they have left. It is important to consult one’s doctor in order to receive the best treatment options possible and then consider which route to pursue after hearing all of the medical treatment options. This entry was posted in Complications on February 9, 2015 by admin.